"I love your bedroom! Why are you changing it?" The reason is simple really. My husband and I need a new bed. The canopy is lovely, but my son, who has Cerebral Palsy among other things, keeps cracking his head on the corners of the hard wood, threatening to fall from the bed, which is rather elevated and insists on crawling under the bed only to be met with years of dust bunnies and other icky stuff. 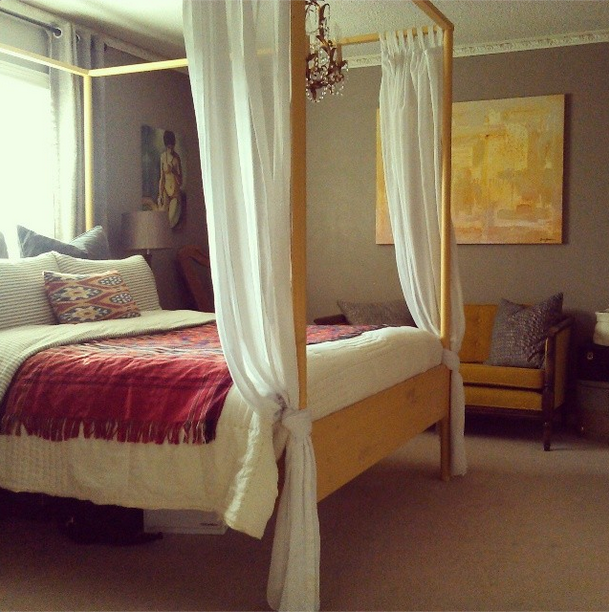 And as all of you decor obsessed readers know, a new bed means rethinking the whole space! I don't use Polyvore much - or at all really - but for this project I wanted to put a few things together to see what it might feel like. So here is my crappy mock-up. Again, this is not what the room will be, just a feeling of the room. The walls are already painted in a sable gray/brown called Ashwood by Behr. It's a little lighter than the color of the bed and I love it. So that won't change. Here's what I already have in place. 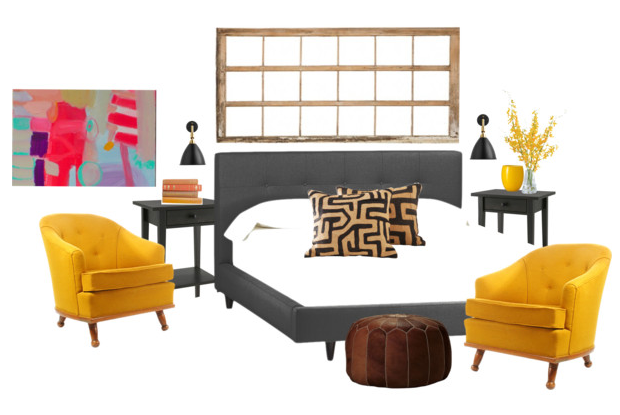 We've removed the yellow Ikea canopy bed to make room for our new midcentury style upholstered platform bed. We got the new bed from a store in Dallas' Bishop Arts Disctrict called Simply Austin. It arrived earlier this week. Oh, it's so wonderful! There is also a window above the bed that I have to work with. I already have the black Hemnes Ikea side tables, but I'll be taking a few inches off of the legs to create the right height for the bed. I may also dip the legs in brass colored paint to give it a metalic look. 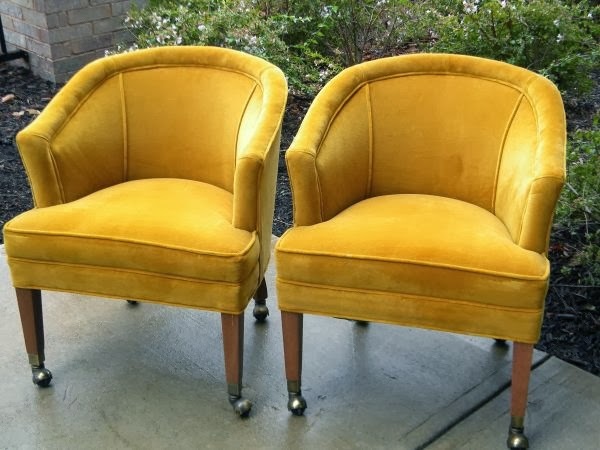 And I also have a pair of wonderful midcentury club chairs in yellow. Remember these guys I picked up last year on the Dallas Craig's List? I really want to create some surface space on the side tables for books so I'm going with wall sconces. After looking around, I was floored by the expense (sheesh). 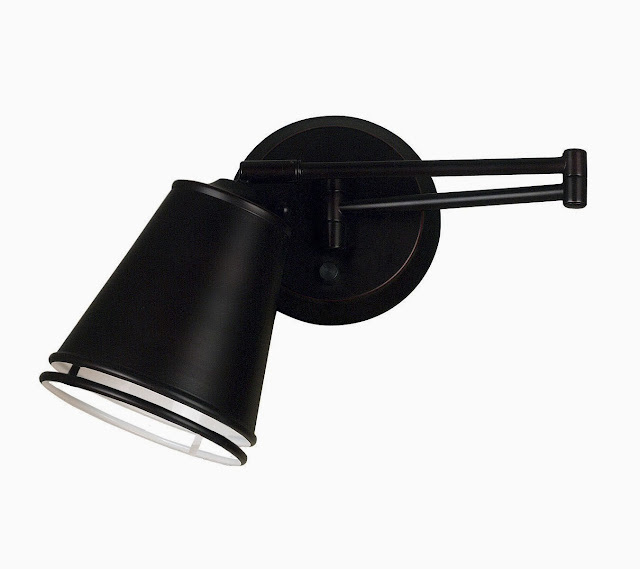 Then I found this pair of swing arm sconces at Amazon for a good deal. 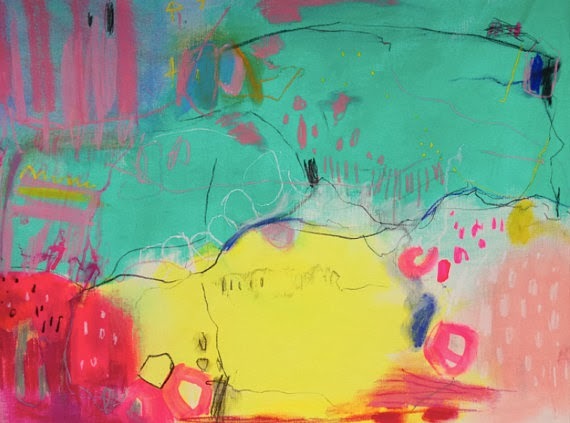 For months, I've been watching the amazing art work of Jenny Andrews Anderson on her blog, My Favorite and My Best, wishing that I might be able to purchase one some day. This month, the fates aligned and I have acquired a wonderfully colorful piece, ready to be framed and hung on the wall of my bedroom. It's called "You Can't Play the Drums", which is funny because my husband is a great drummer, and it measures 24" x 18". I have loved sleeping on you for the past five years. Stay tuned for the reveal - before Christmas is my goal! You can also look forward to seeing your old bed in it's new space in February. I'll send you a photo after it gets its facelift. hi, new to your blog. just started reading this week. i love mfamb! she posted new paintings today and the ones i liked were gone before 9am mountain time! i'll get some of her work one of these days. your room is going to look great. LOVE the bed.